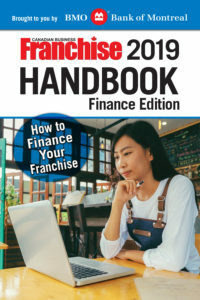 The Canadian Business Franchise Handbook: Finance Edition provides everything one needs to know about running a successful franchise business from a financial perspective. With advice from a range of franchise professionals, this e-book contains an in-depth look at a variety of topics. Readers will learn if owning a franchise is right for them, along with tips for creating a business proposal in order to approach a bank for financing. They will also gain a detailed look at the financial obligations of a franchisee, including tips on drafting a business proposal, understanding the franchise disclosure document, and sage advice on choosing the appropriate insurance coverage to protect your investment. In addition, the ins and outs of advertising and marketing funds are covered, along with pointers on how to make the most of electronic payment systems to help speed the flow of business. Finally, there is a financial Q&A with an existing franchisee in the quick-service restaurant (QSR) space, and a guide to help in the creation of an annual profitability plan.